If the thought of going to the dentist makes your heart race and sweat break out on your forehead, you’re not alone. 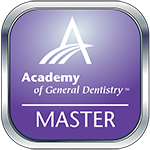 Millions of Americans suffer from some level of dental anxiety, but at San Marcos Gentle Dental, we are dedicated to providing patients stress free, painless dental health care. That’s why our San Marcos, TX practice offers oral conscious sedation to help patients relax and enjoy their dental visit. 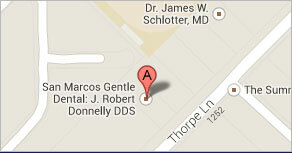 Call the office of Dr. Robert Donnelly to schedule an appointment or find out more about sedation dentistry today. Sedation dentistry has several levels, and there are numerous sedation methods. At San Marcos Gentle Dental, we offer our patients oral conscious sedation. This level of sedation is generally considered ideal for any level of anxiety, and for preparing patients to undergo multiple or extensive treatments. Patients with extreme levels of dental anxiety may be offered a sedative to take the night before their appointment to help them sleep, and will be given a sedative about an hour before their visit to help them relax. Patients who receive oral conscious sedation should not drive or operate other machinery, so you’ll need a friend or family member to drive you to your appointment and pick you up. Patients with several dental anxiety may request to take their sedative at home before arriving at the office, but we recommend taking a sedative after arriving at our office. This allows our staff to monitor your vital signs as the sedative takes effect, and provide treatment at the optimal time. The effects of sedation will vary between patients, but typically, people are able to relax into a sleep-like state. Many patients do not fall fully to sleep, but are extremely relaxed and not fully aware. As your procedure is performed, you will be given a warm blanket, and our team will monitor your vitals throughout the procedure for your safety. Sedation dentistry has also made it possible for dentists to perform numerous or complex dental procedures at one time saving patients time and money without causing undo pain or stress. If you are interested in finding out more about sedation dentistry and how it could benefit you or your family, call San Marcos Gentle Dental to find out more or schedule a consultation today. Our friendly staff, has made your comfort and peace our top priority. Don’t let fear keep you from the dental care you need. Our San Marcos office welcomes patients from New Braunfels, Kyle, Wimberley, and beyond.